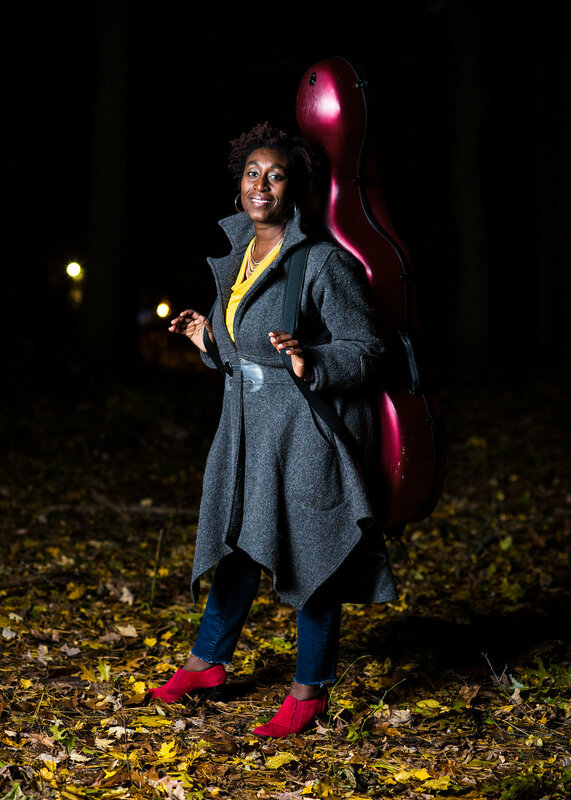 Marshunda Smith (cellist, conductor, violinist, music teacher, and vivacious human being) is one of my favorite people to photograph for personal branding shoots, and we’ve done several. I love cello music and often our shoots have an improvisational soundtrack which ups the ante on our collaboration. On our recent shoot it was daylight savings and I read incorrectly when the sun would be setting that day, which ended up becoming a fortuitous goof. Marshunda arrived with a range of bright clothes in her trunk, like a mango shirt to complement the golden leaves. We started out on the edge of the woods in Beverly, MA and made a range of portraits using natural light and a bit of softbox pop. Then we moved farther into the woods and set up some new shots, when my camera was suddenly like “Um, you want me to focus where exactly? !” By which point the light had all but faded and then, boom, it was pitch dark. Of course we were laughing by this point and every time my light flashed (a Nikon Speedlight SB800 on a stand with a Photek Softlighter 60”) Marshunda was expertly hitting a new pose. Some literal shooting in the dark, and it worked. My photo jam is that intersection of planned-unplanned. The darkness allowed me to get nimble, getting into a “use what you’ve got” mindset. A photo shoot in the dark was not what I pre-visualized earlier while prepping my gear but I was pleased with the outcome, we both were. When we had lots of images to choose from we packed up her cello case and my camera and lighting gear and picked our way back through the brambles to our cars.